A few days after the start of the year 2012, a firestorm of controversy descended upon productions of two very different plays at two very different German-language theaters in Berlin. The issue? So-called “blackfacing” – both productions featured white actors playing black characters while wearing black make-up. 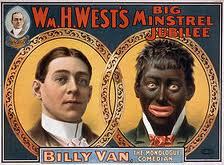 Protestors labeled the productions and theaters as racist, drawing parallels between the productions, minstrelsy and the decidedly racist tradition of blackface within 19th century minstrel shows in the United States, where white performers applied black make-up to themselves to present a deeply stereotyped caricature of a black person. The theaters attempted to defend themselves citing everything from lack of appropriate actors to tradition to the deliberate use of the casting as provocation and artistic expression. Stories of the conflict were picked up by the national and international news media and public forums were held by one of the protested theaters to discuss the topic. The essential questions raised involved the portrayal of race and ethnicity on stage in today’s Germany, no longer mono-ethnic but multicultural, a country where one in every five persons now has Migrationshintergrund (“immigrant background”) and whose cultural institutions often do not yet reflect this diversity. It began with the main stage production of This Is How It Goes, a scintillating play by Neil LaBute that challenges the conception of the United States as a “post-racial” society and asks very hard questions about the associations that cling to the color of one’s skin, and continued with several staged readings in THE LAB examining this topic in current plays from the United States, Great Britain and Germany (see below). Each LAB reading was followed by a post-performance discussion moderated by invited guests from the greater Berlin theater community. When Neo-Nazi terrorist Wesley Connor returns to prison after a failed bomb plot, he is confronted with the two identities that threaten his position within the White Order of Thule most: fatherhood and his own mixed race heritage. Inspired by the true story of Leo Felton and Erica Chase, Am I White travels between linear narrative, recurring dreams and minstrel show nightmare to discover if a singular self exists in the post-modern, “post-racial” United States. When a group of actors gather to give a presentation on a distant genocide, they realize that summaries are not enough. In their attempt to delve into history they struggle with stereotype, fear, and their own personal histories — uncovering the potential for brutality in all of us. Following its critically acclaimed premiere at Victory Gardens, Chicago’s preeminent theater for new work, last season, this scintillating new piece opens the season of New York City’s Soho Rep this fall. We are very pleased to present the German premiere of this important new text. The play, drawing heavily upon history, imagines a meeting between an African-American jazz musician and a patriotic Afrodeutscher in Berlin in 1938. This piece, originally presented in THE LAB in 2006 as Others Within, marks the first time in the nine-year history of THE LAB that a script has been substantially further developed and brought back for another presentation. Alexander Thomas is an actor and playwright originally from Albany, New York. He originated his solo play Throw Pitchfork at Highways Performance Space in Santa Monica, California and premiered it Off-Broadway at the New York Theatre Workshop in 2002. Later that same year the play premiered regionally in upstate New York at the Kitchen Theatre Company in Ithaca. Throw Pitchfork was also produced at JAW West Festival at Portland Center Stage in Portland, Oregon and October Fest at The Ensemble Studio Theater in New York City. 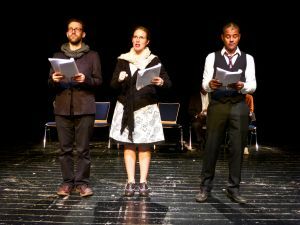 It was the closing act at The 4th Annual Thespis Monodrama Festival in Kiel, Germany where it received a Besondere Auszeichnung (Special Honors Award). Throw Pitchfork has been published by Playscripts, Inc. (www.playscripts.com). Thomas also co-wrote and performed in Black Stuff, a two-man farce about African-American identity that ran at the Kitchen Theatre Company, Highways Performance Space and the New York Fringe Festival. He recently appeared in Steven Berkoff’s stage adaptation of On The Waterfront which ran in London´s West End at The Theatre Royal Haymarket, as well as the Edinburgh Festival, Nottingham Playhouse and the Hong Kong Arts Festival. On The Waterfront won London’s 2010 Whatsonstage.com award for Best Ensemble. At English Theatre Berlin, he appeared in the 10-minute play festival Utopia/Dystopia. Thomas frequently collaborates with the Kitchen Theatre Company in Ithaca, New York and has most recently appeared there in Broke-ology and Opus. Unschuld (Innocence) was the play that served as the basis for one of the productions protested earlier this year. Written by Dea Loher, one of Germany’s most popular, prolific and produced contemporary playwrights, this poetic, expressionistic piece tells the stories of a group of seemingly unrelated characters existing at the fringes of society. An unnamed European city by the sea. Fadoul and Elisio, two illegal African immigrants, see a white woman drown and are too afraid of being deported to save her. A blind young woman, Absolutely, dances naked for men who can see. Mrs. Hadit searches out the families of victims of violent acts to beg forgiveness for crimes she did not commit. Franz has found the job of his life: serving the dead as an undertaker’s assistant, while all that his wife, Rosa, wants from him is a child. Rosa’s mother, Mrs. Sugar, celebrates the progression of her diabetes by moving in with them. And Ella, an aging philosopher, burns all of her books and no longer believes in anything but the unreliability of the world. Dea Loher is unequivocally one of the most significant and highest esteemed contemporary German-language playwrights. The author of nearly 20 plays, multiple radio plays, a libretto, a book of short stories and the recent novel Bugatti taucht auf, Loher has been awarded nearly every significant German prize for excellence as a playwright, including the Bertolt Brecht Literature Prize, the Mülheim Drama Prize and the Berlin Literature Prize, some multiple times. With a body of work dating from 1991, Loher’s plays are marked by innovative uses and combinations of styles of language, merging the poetic with the pedestrian, the literary and the laconic, utilizing the resulting dissonance to great dramatic effect. While her subject matter ranges from small town life to events torn directly from the pages of international news outlets to historical and literary figures such as Medea and the Red Army Faction, Loher continually explores what it is that creates communities, what it is that creates connections between individuals and how these connections are maintained or severed. Loher’s plays have an impact far beyond the boundaries of the German-speaking world; her work has been translated into 28 different languages. Her newest play, Am Schwarzen See, will receive its world premiere at Deutsches Theater Berlin on October 26, 2012. 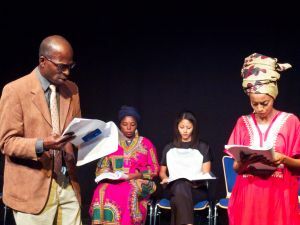 Award-winning British playwright of Nigerian descent Bola Agabje, examines a very different side of immigration—coming back home. Kayode, originally from Nigeria, is a Member of Parliament in London, and has done incredibly well for himself, at least until the most recent election. Following a scandalous defeat, caused at least in part by his perception in Britain as an Nigerian, Kayode finds himself returning home to lick his wounds in Nigeria. Once there, however, it quickly becomes clear to him that his fellow Nigerians now see him as British as finds himself embroiled inan entirely new form of political intrigue. Belong was originally commissioned by Tiata Fahodzi and first produced by Tiata Fahodzi and the Royal Court Theatre at the Royal Court Theatre (Jerwood Theatre Upstairs) on 26th April 2012. Tiata Fahodzi is a British-African theatre company founded in 1996 as a partnership between Nigerian Femi Elufowoju, jr and Ghanaian Ekua Ekumah. ‘Tiata Fahodzi’ amalgamates Yoruba and Twi to mean ‘theatre of the emancipated.’ The company is based in London and produces theatre of international quality. It is deemed a ‘National Portfolio Organisation’ by Arts Council England, indicating its core significance to the artistic life of the country. Lucian Msamati was appointed Artistic Director in 2010. He seeks to establish the company as thoroughly ‘pan-African’. Bola Agbaje was a member of the Young Writers’ Programme at the Royal Court Theatre, London, and her first play, Gone too Far!, premiered there in 2007, directed by Bijan Sheibani, and had another sell out run in 2008. The play won the 2008 Olivier Award for an Outstanding Achievement in an Affiliated Theatre. Bola was also nominated the same year for the Evening Standard Award for Most Promising Playwright of 2008. Her other plays for theatre include: Three Blind Mice (Cardboard Citizens, 2011); Playing The Game (Tricycle Theatre, 2010); My Territory (Soho Theatre, 2010); Off The Endz (Royal Court, 2010); Anything You Can Do (Soho Theatre, 2009); Detaining Justice (Tricycle Theatre, 2009 – part of the `Not Black And White´ season); Legend Of Moremi (Theatre Royal Stratford East, 2008); Good Neighbours (Young Vic, 2008); In Time (Tiata Fahodzi and Eastern Angles, 2008); Sorry Seems To Be The Hardest Word (Royal Court, 2007); Reap What You Sow (Young Vic, 2007); Rivers Run Deep (Hampstead Theatre, 2007). Bola is currently developing Gone Too Far! into a screenplay. Have you seen the new neighbors? Richard Patterson is an upwardly mobile African-American academic. The family of minstrel performers that has moved in next door is rowdy, tacky, shameless and uncouth. They are not just invading his neighborhood – they’re infiltrating his family, his sanity and his entire post-racial lifestyle. 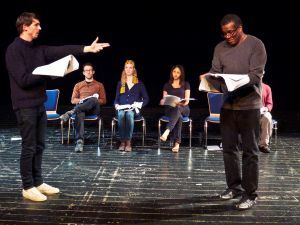 Neighbors quickly made headlines after its premiere at New York’s Public Theater in 2010 for its provocative examination of racial identity in the supposedly post-racial, post-Obama United States. Jacobs-Jenkins, an African-American in his mid-20s, uses the divisive, racist tradition of minstrel shows (a 19th century form of theater in the United States, featuring white and sometimes black performers in blackface as stereotyped caricatures of black persons) to ask hard questions about race and society. Branden Jacobs-Jenkins is a Brooklyn-based playwright, dramaturg and performer. His work has been seen at The Public Theatre, New York Theatre Workshop, amnonst many other NEW York theatres, Theater Bielefeld and the National Theatre London. Branden is developing an adaptation of The Octoroon by Dion Boucicault, directed by Mark Ravenhill with Soho Rep. Theater/NYC. His honors include Princess Grace Awards 2009 and 2010, the Dorothy Strelsin Playwriting Fellowship 2010, a fellowship in playwriting from the New York Foundation for the Arts and the Paula Vogel Award for Playwriting 2011. He also holds an M.A. in Performance Studies from NYU. Joy Kristin Kalu holds a doctorate in theater studies and American studies. She currently works at the Freie Universität Berlin and is preparing her dissertation, The Aesthetics of Repetition (Ästhetik der Wiederholung, Transcipt Verlag Bielefeld 2013), for publication. Alongside her scholarly activities, she has also worked as an assistant director and performer at numerous German and US theaters, including The Actors’ Gang in Los Angeles, the Thalia Theater in Hamburg, the Volksbühne in Berlin and the Wooster Group in New York. She presented a lecture on the current “blackfacing” debate, which she views from the standpoint of appropriation art and reenactment, for the symposium “Authenticity Terrorism” held during the 2012 Autorentheatertage presented by the Deutsches Theater. Listen to an interview with LAB curators Daniel Brunet and Tom Strauss on National Public Radio (NPR) about the Colorblind? series.